Death Road is an incredibly dynamic and strongly addictive racing game set in the distant future. 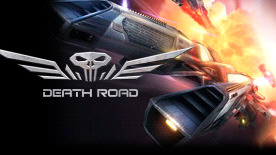 Players compete, using futuristic vehicles on specially designed tracks, armed with a wide array of lethal weapons ranging from standard laser guns to rocket launchers. There is not only an entire single player campaign but also a number of different modes for everyone to enjoy. The game contains single player campaign, 6 quick race game types and will let the player race with friends in multiplayer mode. Throughout the game, players will be awarded with special achievements for epic feats.